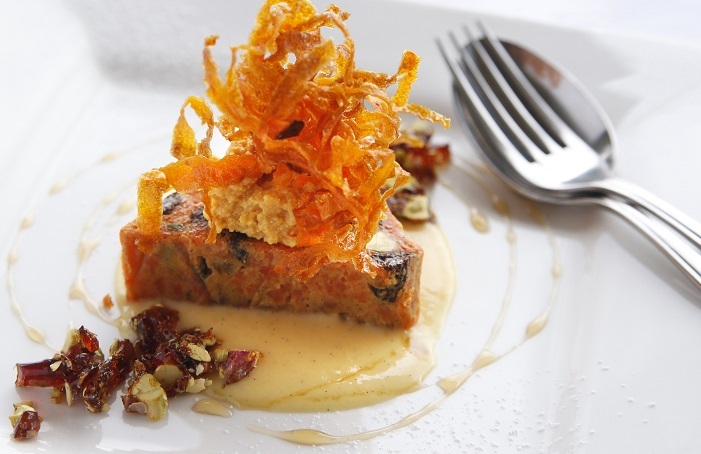 This recipe for “Carrot, Date and Pistachio Cake” was created by Michael Robinson, Head Chef at the Margan Restaurant at Broke Fordwich, in the Hunter Valley of NSW. Margan Restaurant was recently named one of the Top Ten Regional NSW Restaurants by Gourmet Traveller Restaurant Guide 2014. Sift flour, spices and sugar together. Lightly beat oil and eggs together and add to flour. Beat with an electric beater for about a minute until smooth. Fold in dates, nuts and carrots. Pour into tin and bake for an hour. Cool. In the Margan Restaurant we serve with fried carrot ribbons (shredded carrot- do this with a peeler- deep fried in clean oil, drained and cooled) ; vanilla creme anglaise and praline pistachios (toffee coated pistachios). Or a simple dusting of icing sugar works well.